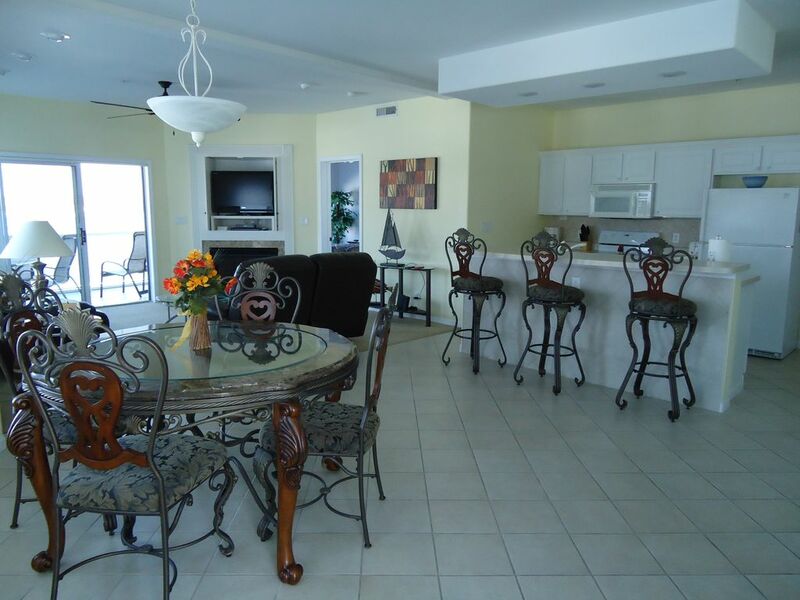 UPSCALE THREE BEDROOM--LARGE WATERFRONT CONDOMINIUM!! CHECK OUR GREAT RATES!!! SLIDE SHOW! Be sure to look. 'Click' on our URL below, just above the calendar to see additional pictures! Welcome to our condominium at Monarch Cove. Monarch Cove condo's are located on a point on the main channel (Mile Marker 2) offering a tremendous view. Our spacious condo is right on the water with an OUTSTANDING VIEW of the main channel from the time you walk in the door!! The condominium is just minutes away from Bagnel Dam, excellent dining or the Factory Outlet Mall with many different types of shops and stores and the wonderful golf courses in the area. Newly built Monarch Cove has an atmosphere like no other complex at the lake with beautifully landscaped grounds and a lakeside lighted promenade (approximately 1/2 mile) completely around the complex to take that evening stroll or that walk for your health. Monarch Cove is off HH and Duckhead Road--GREAT LOCATION!! This large (approximately 1400 square feet) condo is a beautifully decorated, END UNIT, waterfront condominium with windows all around the living area (including the kitchen) facing the lake. It has a master bedroom with a king-size bed and private bath with jetted tub, full window facing the lake, and a private door to deck. The master bedroom has a 23' LCD TV/DVD player. The second and third bedrooms have queen-size beds and 19' LCD TV/DVD players. The second and third bedroom share a full bath next to them with a walk-in shower. This is a great setup for couples or couples with kids to have lots of privacy! The two full baths are furnished with linens (bring your towels for your waterfront activities). The full kitchen has an open breakfast bar, a microwave, dishwasher, refrigerator w/ice maker, cooking utensils, (washer, and dryer in a separate utility room). The living room space is set up for total comfort with a 37' LCD TV/DVD for your enjoyment (the condo is set up for cable in all the rooms). The living room has a gas fireplace to enjoy on those cool evenings. The dining area also has a very nice table and chairs and matching counter stools for your use-along w/the breakfast bar--PLUS a window overlooking the lake while you eat! The covered screened deck has very nice deck furniture for relaxing and glass rails to provide an un-obscured wonderful view of the lake. There also is a gas grill for your enjoyment. Amenities: Elevators (no steps), Air Conditioning, Cable TV, DVD Players, Fireplace, Full Kitchen, Microwave, Dishwasher, Refrigerator, Ice Maker, Cooking Utensils Provided, Linens Provided, Hair Dryer, Washer, Dryer, Gas Grill, 3 Pools- 2 Beautiful Pools Overlooking the Lake Plus a Lap Pool (Shared). Quiet Hours 11 p.m.-7 a.m. Check Out 10:30 a.m.--Check In 4:00 p.m. (If no overlap this can be amended--check with us). A 12 X 36 boat slip is available to be rented with the condo at a cost of $20/day. If you e-mail or call the number on this listing to reserve the condo or ask a question and don't get us right away, please call our home or our cell number below . We always want to be available to answer your questions!! If the dates on the calendar do not work please call us and let us see what we can do! Lakefront view throughout this end unit condo and deck. GREAT main channel VIEW! Ceiling fans in the Living Room, Balcony, and all bedrooms. Cable available in living room and each bedroom. Beautiful screened balcony overlooking the main channel of Lake of the Ozarks with very nice deck furniture for your rest and relaxation. Three heated pools directly on the lake. One is a lap pool. Screened balcony with panaramic lake views. Includes an available boat slip ($20/day) for your usage. Close to Bagnal Dam activities and shopping. This condo was amazing. The view was what it was all about. We ate every one of our meals on the screened patio. The condo was clean and nicely furnished. The owners were amazing. They answered all of my many questions in a very quick timespan. I would highly recommend it. We'll definitively return. very clean and spacious unit but need a boat to get the full benefit from the lake. Condo property is well cared for. Ozarks - great for family vacation esp with elementary and middle school aged kids. Thank you! Everything was clean and very nice place. Great stay for my family of four! Super clean condo. Lots of stairs. Elevator was an option, but we wanted to get our steps in! Loved having a code to get in the front door instead of having to keep up with a key. Pool and hot tub close by. Baxter's for dinner was fabulous! We will definitely stay here again! Four of us rented this condo for a long weekend....it was the cleanest unit I have ever rented! Everything a person would need in the kitchen was available, as were the bathroom supplies (great shower in the master bath) but we did replace any of the paper items we used up. Enjoyed sitting on the deck (thank you for having a drop on the side to ward off the wind) watching the boats and just enjoying being on the water. One person was in a wheel chair and was able to get around the unit using his chair and walker. Did put the outdoor mat over the threshold going to deck and also at the door - metal strip was rather high. Beds were great - have no complaints whatsoever but would recommend putting up grab bars in the bathrooms. Hoping to return to this unit in the future. Oh...the promenade around the cove was just great as my husband was able to enjoy being close to the water. Great view of the main channel. Only negatives are the 2nd & 3rd bedrooms have full size beds, not queen size as advertised. The BBQ grill should be replaced. We strive to provide a comfortable and enjoyable environment for our guest to enjoy. To achieve this each year we try to replace or update furnishing to keep them fresh. This year based on suggestion we have installed a new BBQ grill on our balcony. One of the Queen bedroom sets was purchased in the last two years. We verified the dimensions (60x80) and we stand by the fact that each one is a Queen size bed.